3 Things to do to Prepare for the End! 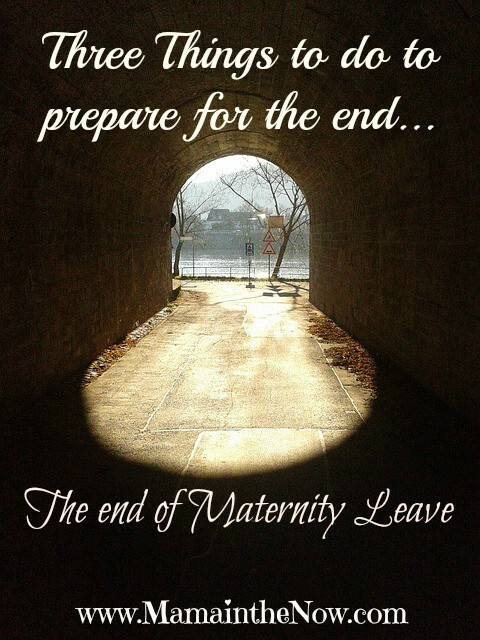 - The End of Maternity Leave! As we all know, all good things must come to an end – and so it is, that I am facing just another three weeks of maternity leave. Don’t get me wrong, I am extremely blessed and fortunate to get a total of 16 weeks with my baby. Our time together is not something I take for granted, nor is it something I waste away. Jonah and I have spent our fourth trimester almost being as close as we were in the first three trimesters. We cuddle and nurse in bed all night long. During the day, he is nursed on demand and otherwise carried or held, primarily by me. On the rare occasion that I lay him in his swing, he is immediately surrounded by loving brothers and/ or father. Jonah’s first three months have been filled with love, lots of love. But… I also know that motherhood is not just a daytime job. Motherhood is 24/7 and they need me as much in the evenings and at night, as they do during the hours I am at work. I am not any less their mother because I work outside of the home. My kids don’t love me less or differently, they don’t forget about me during the day and nor does it scar them that I return to work after my maternity leave ends. Those are the things I remind myself of during the first days back at office. I am currently doing three things to prepare my babies, their nanny and myself for May 12th when I head back to my daytime job. I plan on breast feeding Jonah until he choses to wean, as I did with all the other kids. Therefore pumping has become a natural part of my breastfeeding journey. It is a way for me to stay connected to my baby while I am at the office. It is something I leave behind in the mornings, and I know its smell and taste reminds him of me. So in order to have a sufficient supply on hand for the days that I might not produce as much as he consumes, I start pumping a few weeks before returning to work. I chose not to spend my entire leave on pumping, simply because I don’t want to make it a chore and have it become a negative stress in my life. But also because I want my baby to tell my body how much milk to produce. So instead, I pump once or twice a day from one side, as he nurses on the other. This way I am still bonding with the baby, as I am building my stash of frozen breast milk. I always pump during the early morning feeding, when my milk supply is at it’s highest, and then again sometime in the afternoon. SPEND TIME AWAY FROM THE BABY & START BOTTLE FEEDING! YIKES – this is the hardest part of preparing to return to work, but it is necessary. I still stick to my belief that the maternity leave is primarily for mom to bond with baby. However, I would do Jonah a huge disservice if I just one day left him for 8 hours with a stranger he had never met before. Instead, I try the last few weeks to leave him with our nanny for half an hour here and maybe even an hour there. I am still spending most of my day with him, but now when I take the big kids to school I leave him at home with Jansen and the nanny. This time apart obviously also allows our nanny to get comfortable with having Jonah and Jansen together at the same time. We are also introducing bottle feeding to Jonah, as an alternative to mama! So far we have tried two different types of bottles. We found a bottle that he will take, but he has only successfully taken it from me – which is NOT productive. So our nanny tries every day, at different times in his schedule to feed him with a bottle. He’s stubborn – he wants mama. I do feel comforted that he took the bottle from me, so it is merely a question of him getting used to our nanny feeding him, which I am sure he will learn – eventually. More on this topic at a later time! NUTURE & TAKE CARE OF MAMA! The last thing I do to prepare for the end of my maternity leave is to take care of ME! Returning to work is stressful, emotional and obviously really hard on any new mom, whether it is a first time, second time or even fourth time mom. I know this by now. So when I spend time apart from Jonah over the next few weeks it will be because I am meeting a friend at Starbucks for a latte, or because I am treating myself to a new haircut or pedicure. I will also be spending a little bit of money on a few office-appropriate articles of clothing that fit my postpartum body. I have over the past three months lost 55 lbs of my pregnancy weight. I know I have more pounds to lose, but I chose not to stress over it. The weight will come off as I continue to breastfeed and chase after the boys. However in the meantime it is imperative that I have clothes that fit properly NOW in order to feel comfortable in my own skin. I will be hitting the mall for a few pairs of pants, skirts and some loosely fitting shirts and jackets. There is no need to go on a shopping frenzy, but a few strategic purchases can go a long way, until I can wear more of my pre-Jonah work clothes. So as much as I dread the thought of leaving my four babies behind on May 12th, I know that they will all be well-fed and lovingly cared for. As a mother who works outside of the home, I know from experience that leaving my kids in the morning is the hardest thing I have to do on a daily basis. However, returning home to their squeals of joy, feeling their warm arms around my neck and inhaling their sweet smells is my confirmation that I am their love, their heart and their world – as they are mine. I read your blog…and my throat gets choked up… I did it twice and the second time was harder… at the age of 30 months I weaned my son (he didnt want to). He is 4 years old now and still talks about his “mimis” as he called them… Now that he is growing up so fast I think about and cherish the special bond we still have. Be strong, be encouraged…. Maybe if we both wish hard enough we can stop time… Oh how I dream of being able to stay at home with my munchkins… I do know how it feels… My daughter is will be 10 years old in August (she weaned herself at 26 months) and all I can say is that it was allllll worth it… All the pumping, all the space the milk took in the freezer, all the nursing pads I had to wear, all the running late because I wanted her to have one last time before i left to work… So much more!!! My babies are growing but I still see them as my babies! Oh my goodness I can’t image leaving a baby so young to go back to work 🙁 You have shared some very good trips for preparing though. The time goes by so quickly! It’s so great to see little one growing but then I’m also counting the days of when maternity leave ends. I am SOOO GLAD that I don’t live the US. I’ve always thought of my country (Croatia, if you’re wondering) as not such a great place to live. But when I had my kids, I had them on free health insurance (no hospital bills at all, except a small fee for the prenatal classes and for my husband to be present at birth), after they were born (and some 6 weeks prior to my due date) I was on paid maternity leave until they were a year old (and for the first 6 months I received my full salary, then the national average for the next 6 months). We also received funds from the Department of Health for baby equipment for both our kids (for our firstborn it was enough to pay for the crib, mattress, umbrella stroller, car seat and adapters for the car seat). Most cities and towns also award funds to locals to promote demographic growth, especially for families who chose to have three or more children.